If you are the paranoid type who worry that someone always has their eye on you then this Anti GPS Tracker is for you. What this anti tracker does is block all GPS signals for a 5 meter radius making it impossible for a tracker to track where you are and send those details on to others. 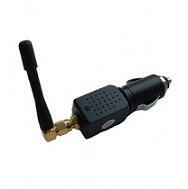 The Anti GPS tracker plugs in to your cigar lighter and is powered from the 12V supply. One thing to note is that by blocking those “tracking” you, there will be the problem that your navigation device will also not work… so you really need to weigh up your paranoia with being practical here. It still is a fairly cool gadget though and could keep you protected should you find your self in a situation like that. The Anti GPS Tracker costs £149 and is available at the link below. Guest Post by Matthew of Gadget Venue. WOW I must say people can some time come up with the best idee’s but this is the worst invention ever, if you live in SOuth Africa, The car jackings are so high here and the only way to combat this was with your tracking devise in your car. Now the car jackers can just get one of these and they can get away with the car jacking no problem. Thanks but no thanks! You are providing toys for bad boys with this ‘cool’ tracking blocker! My car is protected with a GPS tracking system, so when my car is stolen, it is easy for the police to track it down and nail the criminals who stole my car. This device just made this impossible. ever thought of that, hum? Or was it your intend to help the bad guys? I agree its not helpful for people who are trying to protect their vehicle from theft. However, my company vehicle is tracked and monitored by my boss. I do not like this. Im undecided whether or not to play games with this device to encourage them to simply switch it off permanently. I agree with all of you guys on those points. But i have a much different scenerio. My girlfriend is being “tracked” somehow through a GPS device that her ex installed in her car. Hes a legitimate stalker. We have looked all over for it but have been unsuccessful. The car is leased, if this device is installed within the dash board, engine etc, we would have to pull the car apart to find it. This GPS disabler will help her out until shes able to turn the car in or find whatever is in it. Not to mention, her and I would feel much safer. So i applaude the effort to fix the mistake of making portable GPS devices they will sell to any moron. I have been stalked for two years!! If I can get my life back, just to shop it would be worth it. Since the wack jobs can follow you we need some protection! I have a major problem with being stalked. It would be such a blessing to be able to shop or go to the veterinarian’s office and not be harrassed by bullys who show up everywhere I go.